Deacon's set includes: crosses 1 pcs. - 17 cm, 7 pcs. - 8 cm, 2 pcs. - 6 cm. Total - 10 pieces. Protodeacon's set includes: crosses 1 pcs. - 17 cm, 9 pcs. - 8 cm, 2 pcs. - 6 cm. Total - 12 pieces. Priest's set includes: crosses 1 pcs. - 17 cm, 8 pcs. - 8 cm, 3 pcs. - 6 cm, 1 pcs. - 4 cm; 1 star - 17 cm. Total - 14 pieces. Bishop's set includes: crosses: 7 pcs. - 17 cm, 7 pcs. - 8 cm, 3 pcs. - 6 cm, 1 pcs. - 4 cm; 3 stars - 17 cm. Total - 21 pieces. 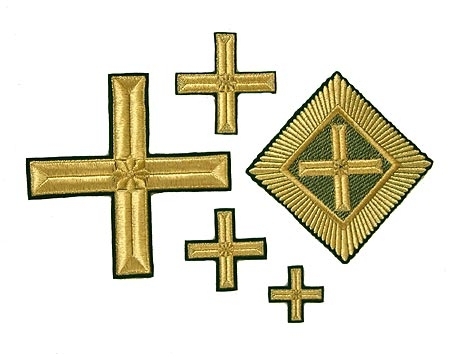 These crosses are embroidered with original German threads Madeira or Gunold. With these German threads you can rest assured that the shine of your crosses will last for a long time.